We are publishing an interview of Mr. Alen Abraham, CEO of Plutomen Technologies – An Ahmedabad based startup is zooming into orbit for creating innovative solutions to acquiring AR/VR landscape. Alen and Keyur, the founders of Plutomen, were working on a variety of product ideas in diverse domains. Since their college days they were driven to develop applications and products which can resolve basic issues and facilitate ease across walks of life. While individually pursuing their product developments they faced similar issues for aggregation of technologically equipped and expert manpower. Brainstorming over the ways to resolve resource sourcing, they formulated the idea of the start-up Plutomen. Thus, Plutomen was born with this very dream of forming a capable team armed to create amazing products from scratch. 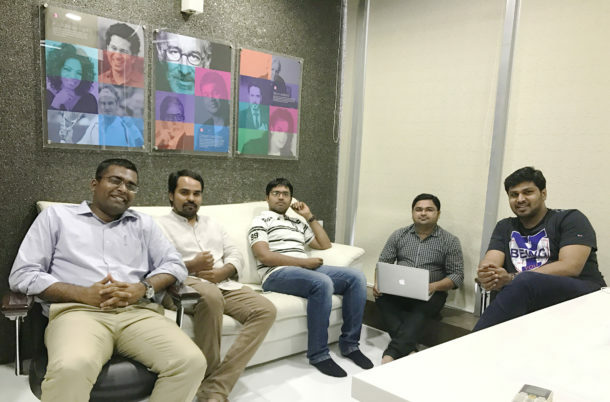 In this spirit, Plutomen brought in co-founders Jankar and Hiren, who are technology experts. 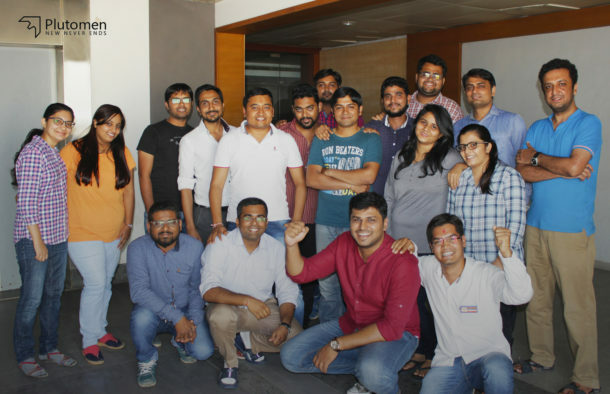 Plutomen, an Ahmedabad based startup is a technology start-up focused on developing innovative product solutions and delivering reliable services. At Plutomen, we believe one and all, small or big – problems for our clients as well as people at large are potential projects for us. We are driven to create product and service solutions for all industries across all domains of business. The primary product under advanced stage of development is touted to be the fastest photo sharing application, Flashtr. There are other projects in the pipeline which include an IoT product solution addressing media management and a schedule management for large scale teams amongst others. We are right now operating from Ahmedabad, Gujarat. We started Plutomen in Oct 2016 and registered it as a private limited company in Nov 2016. The key technology focus areas for Plutomen as of now are Augmented Reality, Virtual Reality, Gaming, IoT, 2D & 3D Animation, Mobility and Web Applications. Plutomen has developed specialized offerings for the Real Estate Industry, Industrial Sector, Media and Marketing Agencies and the Hi-Tech Industry. We have the dream of becoming the next big technology firm in the world and we are very serious about it. Our value proposition ‘New Never Ends’ thrives on the idea of believing in the possibility of creating something new. We believe in pushing the limits on all sides i.e. technology, design, process and efforts which shall deliver amazing product solutions and robust services which help business houses optimize cost and workhours. Our mission is to aggregate the best of talents across our country and we are sure that if we succeed in sourcing the right talent, we will be able to achieve our vision within a span of next decade. There are two things about Plutomen which are unique –our technology expertise and business expertise. Plutomen is a budding start-up, with less than a year of experience, however we have achieved certain business milestones in the few months of our working. a) Plutomen has acquired HJ Dimensions, a Technology firm based out of Ahmedabad with the entire team. HJ Dimensions’ team brought in requisite capabilities like Enterprise Application Development, IOT and Gaming. b) Plutomen has sourced seed funding from Nirav Patel, the MD of Abaj Electronics Group, Ahmedabad. c) Plutomen has acquired Oryden Techlabs, a technology & design lab based out of Ahmedabad. The entire team of Oryden has been absorbed by Plutomen. Erstwhile, Oryden was one of the major players in AR/VR, 3D, 2D design space in India, especially for the industries like Real Estate, Industrial Sector, Healthcare, Education sector etc., Oryden was the company founded by Keyur and Ravi which was later acquired by SquareYards. In December 2016, Oryden de-merged from SqaureYards. Plutomen is working on an application called Flashtr. It is being developed as the fastest photo sharing application ever. Plutomen has already applied for the Provisional Patent for process of fastest photo sharing. Flashtr is planned for May 2017 release. The team is fairly confident of achieving global traction with the product. A detailed marketing plan for worldwide release and phase out is under advance stages of preparation. Few IoT products are also in pipeline, primarily in media management domain. However we shall be constrained to reveal further details on the idea for obvious reasons. The team is also working on a Virtual Dressing Room concept amongst other innovative ideas in designing and customer acquaintance market space for various brands. Plutomen has a two-pronged revenue strategy. Primarily there are 2 divisions, namely Services for Service revenue based model and secondly, Products which is focused on development of product solutions. Presently the application under launch plan i.e. Flashtr shall be a free product, which shall spin into revenue mode subsequent to market penetration either through advertising or branding modes. As we explained, we believe in becoming true blue innovators – pushing our limits in all directions. We are striving to create solutions which are new, increasing ease, effective and with a sustainable revenue model. We are equally focused on developing potent solutions for services and products. At present, we are focused on our first product Flashtr. We are diverting all our team efforts to make the launch a huge success with substantial market penetration across the globe. Our innovative services are also gaining a lot of traction across business domains of various industries. Plutomen team also provides technology consultation and support to other start-ups, with a focus to boost the Indian start-up ecosystem. Thanks Alen. Best of luck!